Good organization is invisible. A mess stares you in the face. The concept of decluttering is huge now with Marie Kondo’s “The Life-Changing Magic Of Tidying Up” currently topping the New York Times bestseller list. And it’s that popular for a reason. When your house is untidy and in chaos, it makes you feel overwhelmed, stressed, and frustrated. Your environment affects how you feel, therefore, tidying up and organizing your house may change the way you experience life. In order to keep your place nice and tidy, stop holding onto things you don’t need and minimize your belongings – it will make your life way easier. And for the things you still choose to keep, organize them in a way that makes your house look neat. Take one room at a time, and aim to get it sorted in a week. This way, in a couple of weeks, your place will be unrecognizable. I’ve gathered ten of the best decluttering hacks to get you started. If you’ve ever tried to declutter, you’ve probably noticed how we tend to accumulate a lot of stuff over time. Instead of gathering a bunch of clothes, shoes, magazines, appliances, and other random things, simply adopt the “One in – one out” philosophy, which means that before buying anything new, you need to get rid of something old in order to make space for a new thing. It will not only keep your house tidier but will also minimize your consumption and save money. Whether in your home office or one at work, your desk needs to be clean and tidy. Although I know how easy it is to get messy here! To keep everything organized, use the clear plastic boxes to keep things in order. Cord clutter is one thing that can drive a lot of people crazy! All the different chargers for phones and gadgets, wires, and extension cords can make your room look like a mess, even if everything else is in the right order. 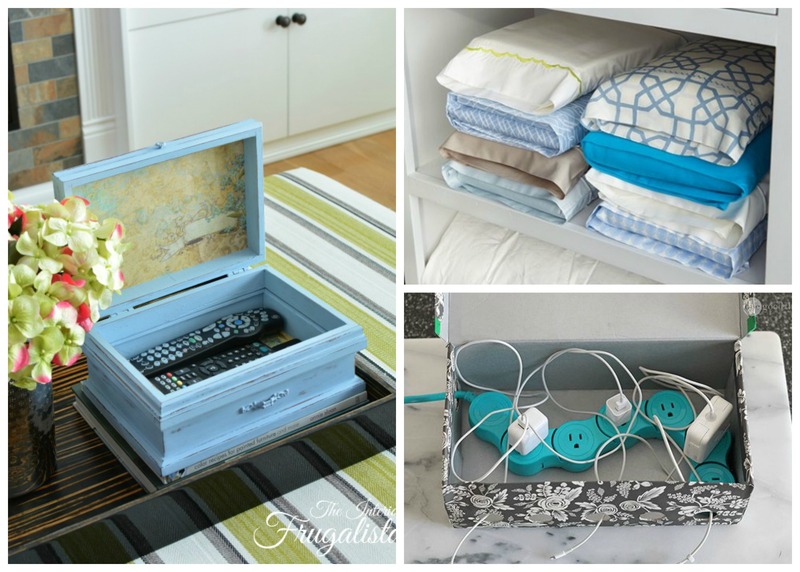 This DIY charging station is a perfect solution for hiding the unwanted cords and making your place look well-groomed. Clean laundry can get disordered in your closet, especially when you try to find the matching sheets and pillowcases and create a chaos in the process. This simple hack makes it easy to keep complete sets of sheets together. They will stack more uniformly as well. Shoes also tend to create a lot of clutter. But you can easily solve it with hangers and clips. It’s an incredible way to use an otherwise unused space and is very convenient. Things can get extremely disheveled under the kitchen or bathroom sink, where you keep most of your cleaning supplies and perhaps some gadgets. Even though this muddle may not be visible on the outside, it’s really annoying when you can’t find what you’re looking for. So say goodbye to all the mess when you follow this easy organizing tutorial. As already discussed, cord clutter can be super annoying. To organize the wires under your TV table, use a cardboard box. Whether it’s those small kitchen or office supplies, organizing them into small boxes helps to keep everything in place and order. This trick can also be used for your makeup, hair bands, bobby pins, etc. If you have lots of scarfs, you know how frustrating it can be when you need to find the one you need! This smart hack using shower hooks will help you organize your scarfs by color or material, and will make them very easy to find and convenient to store. Another thing that creates clutter in the house is an abundance of all the different remote controls (where do they come from and what are they for? It’s always a mystery). To solve this puzzle once and for all, try out this DIY vintage jewelry box hack. It’s an easy and attractive way to store your remotes and have your entertainment room look great! The clutter in our homes clutters our minds as well. Having a tidy and pretty space can create the whole new mood and atmosphere at your place. These simple yet effective hacks will help you keep your rooms tidier and more organized. But most importantly, embrace the “less is more” lifestyle, which will make life easier and your bank account bigger. Love all these ideas! Recently, I have been really getting into the minimalist lifestyle! On my blog, I created a “4 Week Minimalist” challenge and have been writing about each week as I complete it. I will need to incorporate some of these ideas!